The Trump Administration has decided to impose a 10% tax on Americans this holiday season. 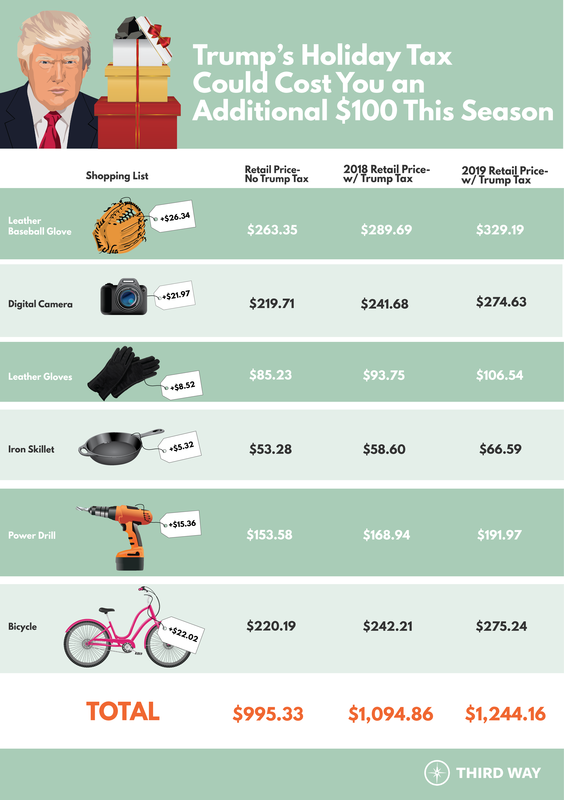 The average shopper can expect to see the cost of gifts rise $100 this year and $249 next year. This new tax is a result of President Trump’s escalation of the already-tense trade war with China; he recently raised the number of Chinese imports subject to tariffs to $250 billion worth of goods.1 President Trump claims that his trade war will help shrink the trade deficit and bring factories back to the US.2 Rather, the US trade deficit with China reached an all-time high of $87 billion in September.3 What this trade war will do is lead to painful price increases for the average American. Next year’s holiday season looks even tougher for shoppers. Currently standing at 10% for a list of 5,745 items, the tariffs are set to increase to 25% starting in 2019. And because China and the US have developed such complex trade ties over the past quarter-century, many items cannot easily be imported from other, tariff-exempt countries. 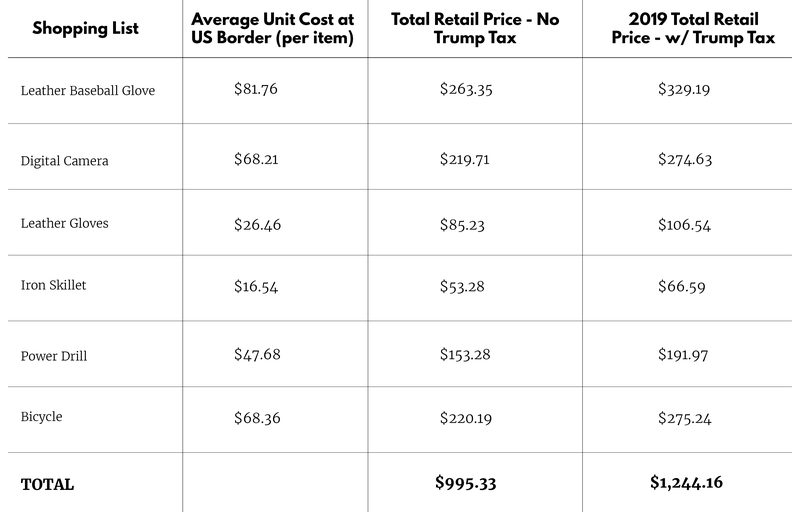 Under next year’s tariffs, the average shopper will be spending $249 more thanks to Trump’s Holiday tax. To arrive at these numbers, we started by calculating the average price at the border for each item, using data from the United States International Trade Commission (USITC).5 We then assumed that the final store price of each good is roughly triple the unit cost (also called “landed cost”) based on a formula from a Progressive Economy study.6 The average sales tax of 7.37% was calculated from a population-weighted average of state and local sales taxes across the 50 states and the District of Columbia. We assume current import levels, noting that foreign production may move from China to other countries to avoid the tariffs. Should there be major shifts in production, they would likely not be quick since China is a major global manufacturer of these items. “USTR Finalizes Tariffs on $200 Billion of Chinese Imports in Response to China’s Unfair Trade Practices.” Office of the United States Trade Representative. 17 Sep. 2018. ustr.gov/about-us/policy-offices/press-office/press-releases/2018/september/ustr-finalizes-tariffs-200. Accessed 29 Oct. 2018. Tankersley, Jim. “No, Tariffs Aren’t Going to Pay Down the National Debt.” New York Times. 7 Aug. 2018. www.nytimes.com/2018/08/07/business/no-tariffs-arent-going-to-pay-down-the-national-debt.html. Accessed 29 Oct. 2018. Mutikani, Lucia. “U.S. trade gap widens; deficit with China rises to record high.” Reuters. 2 Nov. 2018. www.reuters.com/article/us-usa-economy-tradefigures/us-trade-gap-widens-deficit-with-china-rises-to-record-high-idUSKCN1N71DL. Accessed 5 Nov. 2018. Smith, Ana S. “Consumers Will Spend 4.1 Percent More than Last Year during Winter Holidays, According to NRF Survey.” National Retail Federation. 24 Oct. 2018. www.nrf.com/media/press-releases/consumers-will-spend-41-percent-more-last-year-during-winter-holidays-according?utm_medium=Homepage%20CTA&utm_source=Website&utm_campaign=Winter%20Holidays&utm_content=Holiday%201%20Release. Accessed 5 Nov. 2018. U.S. International Trade Commission Interactive Tariff and Trade Database. https://dataweb.usitc.gov/?f=beta. Accessed 29 Oct. 2018. Gresser, Edward. 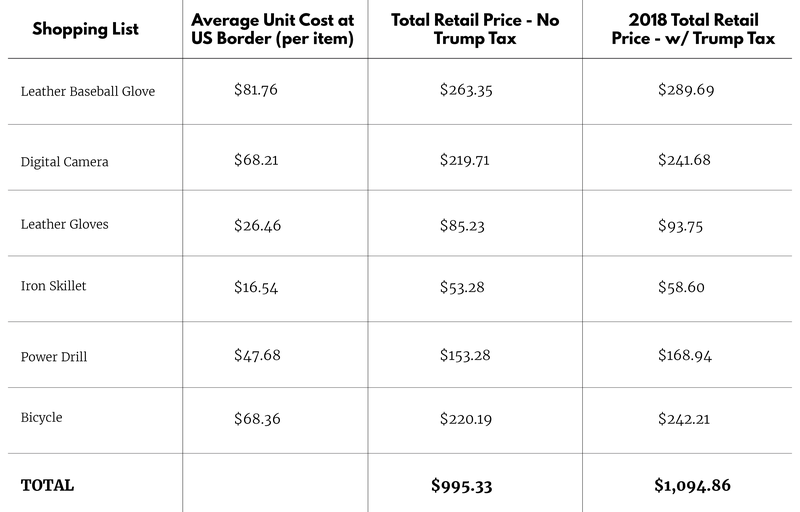 “The Rebirth of Pro-Shopper Populism: Affordable Shoes, Outdoor Apparel, and the Case for Tariff Reform.” Progressive Economy. Jun. 2011. p. 6. www.progressive-economy.org/wp-content/uploads/2012/05/tariffs.taxation.final_1.pdf. Accessed 5 Nov. 2018.